Who will be the next Winner of the Bloodlines Share & Review contest? 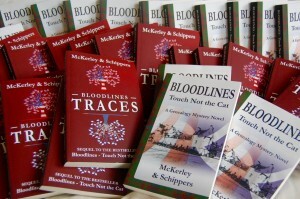 The winner receives a paperback copy of Bloodlines – Traces or Bloodlines- Touch Not the Cat, sent to an address of their choice in either Europe, U.S.A or Australia. Follow American homicide detective Cathy Stewart in 2011, when her ancestral family lures her from Raleigh, North Carolina to the Scottish Highlands and makes her travel back to Victorian and Edwardian times. it all comes together in the narrative of Bloodlines- Touch Not the Cat and Bloodlines-Traces. Visit our website to download the first 4 chapters for free or take a tour of the photo gallery,behind the scenes blogs, and reviews.